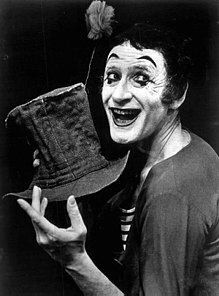 Marcel Mangel (22 March 1923 – 22 September 2007), more famous by his stage name Marcel Marceau, was a French entertainer, the world's most famous mime. Perhaps true appreciation of Marceau requires a step back in time. Before Marceau broke out of an invisible box and stepped into millions of American's living rooms on Max Liebman's "Show of Shows" nearly 40 years ago, you could fit the number of people who knew or much less cared anything about the art of pantomime in a Citroen. What we know of mime — the mute theatrics, the exaggerated body language, the requisite black-and-white get-up — was essentially minted by Marceau. … When Marceau is gone, we won't say, "There goes one of the world's greatest mimes," but "There goes 'the' world's great mime." This page was last edited on 18 November 2018, at 09:59.